The 15th Annual Column of Hope Gala held in Buffalo, New York on Oct. 21, 2017 continued a tradition of community engagement in the funding of pioneering research in Chiari and syringomyelia. 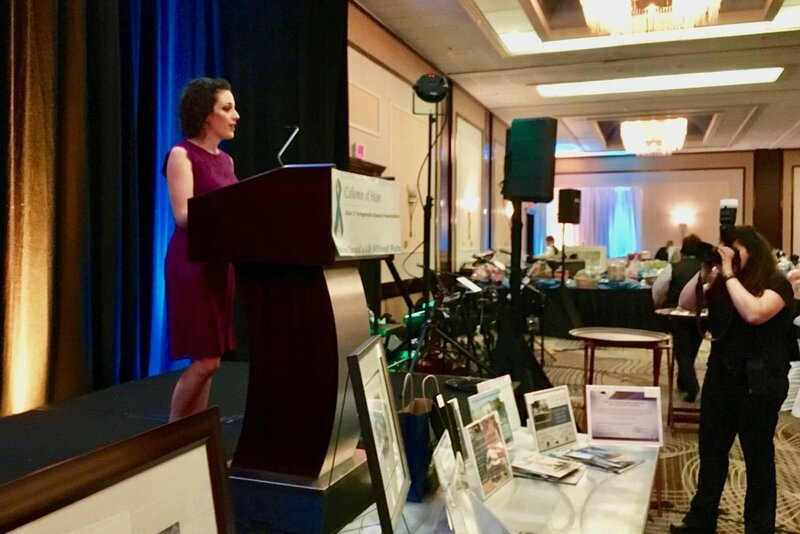 This year's Gala, Working Toward A Day Without Pain Gala: Community of Caring, brought together 220 attendees from New York, New Jersey, Michigan, Illinois, Connecticut, Pennsylvania, and Ontario Canada. Participants included business leaders, medical professionals, and others passionate about making a change in the lives of those affected with these disorders. Volunteers from New York, New Jersey, Florida, and Colorado contributed to making the event a success. The Hyatt Regency Buffalo Hotel and Conference Center provided a wonderful setting for great turnout of the 15th Annual Gala. University of Buffalo pediatric neurosurgeon Dr. Renee Reynolds addressing the audience. Column of Hope President Mark Kane addresses audience at Column of Hope 2015 Gala. Now in its 6th year, the Continuing Medical Education event held the morning of the Gala event is dedicated to bringing knowledge of Chiari, syringomyelia, and related disorders to medical professionals. At this years CME event, I had the privilege of presenting The Chiari I Malformation: The Challenges of Diagnosis & Treatment. Among the challenges in diagnosis are recognizing disorders that can mimic Chiari I including Pseudotumor Cerebri and Spontaneous Intracranial Hypotension. Following my presentation, Dr. Renée Reynolds, Assistant Professor of Neurosurgery at State University of New York at Buffalo, presented a series of cases demonstrating the evaluation, treatment, and challenges of the Chiari I malformation in children. Supporters of the Column of Hope Gala are dedicated to advancing the medical science of Chiari and syringomyelia. Over the past 15 annual Galas, they have contributed close to $900,000 in research funding. Other than a small amount dedicated to the CME event, funds raised by the Gala’s auction are dedicated to research. Column of Hope administrative funding is raised separately. The success of the research funding is evidenced by the 28 articles of COH-supported research published over the past 15 years. The pace of research publication has been increasing with five reports published in 2016 and six in 2017. Furthermore, these articles are being published in prominent medical and research journals such as Nature, Science Report, World Neurosurgery, and the American Journal of Neuro Radiology. Medical science knows no borders. The devoted Column of Hope community is pushing the barriers of knowledge and understanding of Chiari I and syringomyelia to the benefit of Chiari and syringomyelia sufferers world-wide. This rich tradition just celebrated its 15th year in Buffalo, New York. Syrinx to subarachnoid shunting for syringomyelia. Davidson K, Rogers JM, Stoodley MA. World Neurosurg. 2017 Oct 7. Characteristics of CSF Velocity-Time Profile in Posttraumatic Syringomyelia. Yeo J, Cheng S, Hemley S, Lee BB, Stoodley M, Bilston L.
AJNR Am J Neuroradiol. 2017 Sep;38(9):1839-1844. Treatment of Syringomyelia in Patients with Arachnoiditis at the Craniocervical Junction. Davidoff CL, Liu S, Wong JHY, Koustais S, Rogers JM, Stoodley MA. The ultrastructure of spinal cord perivascular spaces: Implications for the circulation of cerebrospinal fluid. Lam MA, Hemley SJ, Najafi E, Vella NGF, Bilston LE, Stoodley MA. Sci Rep. 2017 Oct 10;7(1):12924. Sustained high-pressure in the spinal subarachnoid space while arterial expansion is low may be linked to syrinx development. Clarke EC, Fletcher DF, Bilston LE. Comput Methods Biomech Biomed Engin. 2017 Apr;20(5):457-467. Chiari malformation may increase perivascular cerebrospinal fluid flow into the spinal cord: A subject-specific computational modelling study. Lloyd RA, Fletcher DF, Clarke EC, Bilston LE. J Biomech. 2017 Dec 8;65:185-193. Longitudinal measurements of syrinx size in a rat model of posttraumatic syringomyelia. Najafi E, Bilston LE, Song X, Bongers A, Stoodley MA, Cheng S, Hemley SJ. J Neurosurg Spine. 2016 Jun;24(6):941-8. Direct-trauma model of posttraumatic syringomyelia with a computer-controlled motorized spinal cord impactor. Wong JH, Song X, Hemley SJ, Bilston LE, Cheng S, Stoodley MA. J Neurosurg Spine. 2016 May;24(5):797-805. Cerebellar and hindbrain motion in Chiari malformation with and without syringomyelia. Leung V, Magnussen JS, Stoodley MA, Bilston LE. J Neurosurg Spine. 2016 Apr;24(4):546-55. The Cervical Spinal Canal Tapers Differently in Patients with Chiari I with and without Syringomyelia. Thompson A, Madan N, Hesselink JR, Weinstein G, Munoz del Rio A, Haughton V.
AJNR Am J Neuroradiol. 2016 Apr;37(4):755-8. Najafi E, Stoodley MA, Bilston LE, Hemley SJ.